Fatsia japonica is the botanical/scientific name for the Japanese aralia or paper plant. It is widely valued by gardeners for its ornate evergreen foliage, architectural habit and fall flowers and black fruits. Sometimes Fatsia japonica is called the false castor bean, as it can be mistakenly identified as the poisonous castor bean (Ricinus communis). Grow Fatsia japonica outdoors year-round in U.S. Department of Agriculture winter hardiness zones 8 through 10, as a houseplant in cold winter regions. Japanese aralia is native to the coastal woodlands of Japan and the southern reaches of the Korean Peninsula, according to the American Horticultural Society's "A-Z Encyclopedia of Garden Plants." 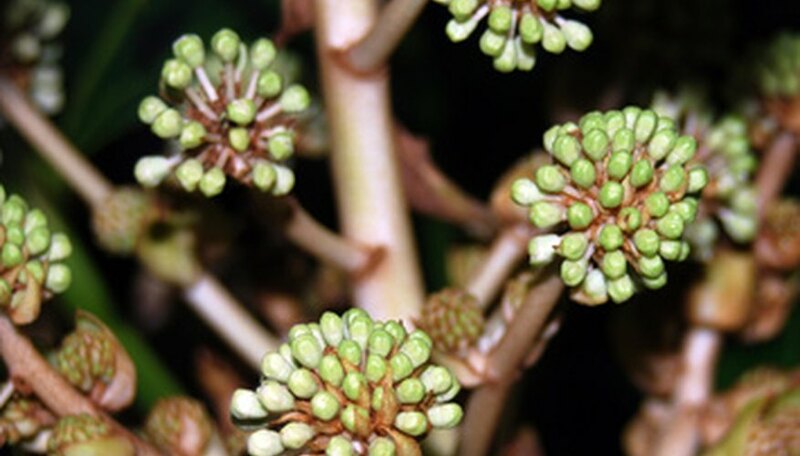 Within the larger plant kingdom, Japanese aralia is an angiosperm and dicotyledon (dicot) because it flowers, produces two seed leaves when it germinates, and develops a branching vein structure in its foliage. It is a member of the aralia family, Araliaceae, making it a close cousin to other ornamental plants like schefflera, devil's walking stick, spikenard, geranium-leaf aralia and English ivy. Depending on whether this evergreen shrub is nipped back by winter frosts, the Japanese aralia can grow anywhere from 5 to 12 feet tall and 3 to 10 feet wide. It attains an upright but spreading, suckering habit with a rounded overall shape. When grown as a houseplant, the tips of stems can be pruned off in mid-spring to control the overall size and shape. The thick stems bear smooth, dark green leaves with seven to 11 lobes, looking like fans or hand palms measuring 6 to 16 inches in diameter. The lobe edges have tiny teeth and can look slightly wavy. In fall, a long stalk appears on stem tips above the leaves to reveal a branched cluster (umbel) of rounded masses of tiny white flowers. Once pollinated by insects, the blossoms become small pea-like black berries that quickly drop to the soil below. If winters are not too cold, the foliage remains year-round. It sprouts back from its roots in spring if winter cold kills back all above-ground stems. Plant Japanese aralia in any fertile, moist but well-draining soil. If soil is consistently moist and summers not too hot, it grows in full sun exposures, but it is prized by gardeners as a plant well-suited to the partially shaded areas of woodland gardens. Avoid windy locations, especially cold, dry winds in fall and winter. In the growing season, water moderately, but greatly reduce watering in the winter. If growing a variegated leaf variety, such as Aurea, Marginata or Variegata, do not expose it to full sunlight.